74, lot Mabrouka, Q.I Bensodua, 30000 Fes, Morocco. From 1975 as family business. Pneumatique Bensouda started its activities at 1999. Selling all kind of Tyres and Batteries. The North-East of Morocco but we have a good business relationship with customers all over Morocco. Almost all international well known brands (Michelin, Bridgestone, continental, Dunlop, Good Year, Kumho, Hankook, Toyo and so on). Henan, chengshan, Austone, Kingstone, Jinglun and some other Chinese brands. (Distributor). We have 2 warehouses. The first one, located in down Town, is specialized on passenger’s car and light truck (200 m²). 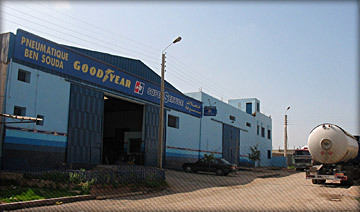 The second one, located at the big industrial Zone of Fes city, is used as a point of sale of Truck, OTR and Agricultural tyres and a warehouse to stock tyres (2500m²). Wholesalers, Retailers, Industries, Government and End User.